Following a disastrous home series against Sri Lanka, an abysmal Asia Cup and an abject showing at the World T20, Bangladesh Cricket has reached a new low. Jeesh argues that one of the main factors behind this recent string of poor performances is the lack of experienced, professional coaches in the National set-up, a shortcoming that the BCB has failed to address till date. 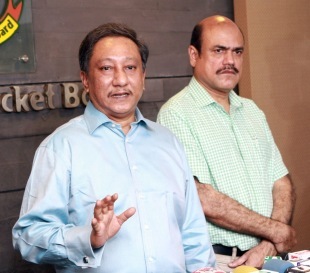 For Bangladesh Cricket to move out of the doldrums, it is imminently necessary for the BCB to introspectively identify the mistakes they have made and take immediate, substantive action - beginning with the appointment of a new Head Coach. When the Bangladesh Cricket Board (BCB) appointed Shane Jurgensen as permanent coach from his interim role, they said it was because the Australian proved himself, and that the team played well under him. They were not wrong. Under Jurgensen, Bangladesh beat West Indies 3-2 at home in an ODI series in 2012, whitewashed New Zealand 3-0 at home in an ODI series in 2013, drew a Test series against the same in 2013 and earned creditable results playing away in Sri Lanka. On paper, Shane Jurgensen seemed like a coach doing wonders for Bangladesh. But BCB never thought strategically about their decision. Was Bangladesh's success due to the Australians ability to organize the team or was he riding on the work done by his predecessors Jamie Siddons and Stuart Law? Or perhaps, Bangladesh had a group of players who have been playing together for a while and were in their prime? Or maybe they were playing with the confidence boost they had gotten from the Bangladesh Premier Legaue (BPL)? Did Shane Jurgensen possess the experience and knowledge to do the job that coaching veterans like Dav Whatmore found so challenging? If BCB pondered about all of these questions, they might have thought twice before handing Jurgensen a permanent contract. Not too long ago, Shane Jurgensen was receiving criticism for his failure in his main responsibility as a fast bowling coach. The quality of pace bowling deteriorated to such an extent, that the Australian should have been let go at that point. After the failed stints of Stuart Law and Richard Pybus, the BCB was also finding it challenging to attract quality international coaches. In this post-IPL era, most big-name coaches preferred shorter stints with high-value contracts. The BCB's history of falling out with foreign coaches was no secret, and it was very unlikely they would be willing to spend large sums on a high-profile coach. So the decision to make Shane Jurgensen permanent was probably made out of convenience rather than the need of the hour. The BCB also failed to realize that the Australian had very little coaching experience, not even as a head coach at State or Club level. In the only international stint he had as bowling coach of New Zealand, he was axed after poor performance. The only strategy in Jurgensen's appointment was probably a reduced wage budget and a novice coach who could be manipulated and wouldn't be vocal or demanding towards the many working committees of the BCB. Despite knowing that Shane Jurgensen's expertise lies in bowling, the BCB did not bother to appoint a specialized batting coach. Instead, they decided to club the responsibility for this skill set with the job description of the newly appointed fielding coach Corey Richards. In this day and age of specialization, where even foreign State/Club teams have coaches for every discipline, Bangladesh placed the entire burden on two, young, inexperienced individuals. The appointment of Richard McIness as the Head Coach of the BCB Academy was an excellent move, but one cannot help but wonder whether the former Bangladesh Under-19 coach is a lone warrior, fighting for a lost cause. Remember the unsuccessful stint of an apparently 'homesick' Richard Pybus? Well, the Englishman has been appointed Director of Cricket for the West Indies, with the responsibility of developing and grooming emerging and national level players for the next three years. The BCB failed to convince the same person to take over the head coach role, eventually pinning all the blame on his inflexibility and unprofessionalism. The appointment of Richard Pybus shows the strategic thinking of the West Indies Cricket Board (WICB). Their head coach, Otis Gibson, is supported by Toby Radford, Desmond Haynes (Batting Coach), Richie Richardson (Team Manager) and Saqlain Mushtaq (Spin Coach). Anyone who has been following West Indies in the WT20 will have an idea of the impact Saqlain has had on their spinners. Saqlain Mushtaq could have been playing a similar role for Bangladesh today. Instead, the BCB was so busy, they could not decide how to get the best out of him. Sri Lanka too has a great coaching bench with the recently appointed Paul Farbrace, former captain Marvan Atapattu, the legendary Vaas and Muralitharan and a very capable fielding coach in Ruwan Kalpage. When a country does not have the infrastructure, domestic cricket or talent base, the least they can do is have the right set of trainers/teachers/mentors in place. So that every player gets the best individual attention, nurture and care. Following a miserable Asia Cup and WT20 2014, the BCB will now appoint a fact-finding committee, tasked with the responsibility of identifying what went wrong. Their daggers will be out and anyone who can be blamed or scapegoated will be excoriated and rebuked. They will undoubtedly find faults with the head coach, the captain and some senior players. Fans will lambast these individuals and scrutinize their personal lives and what they are doing off the field. For a short while, these individuals will be the country's enemy number one - all the blame will be pinned on them. But the BCB are equally to blame for this debacle and should not be held any less accountable for the mess they have created. It was their decision to put the weight of expectation of 160 million people on the shoulders of a novice coach. Even Associate level teams are employing individuals with more experience as mentors and coaches. Afghanistan's head coach Kabir Khan has been on the job for the last ten years, coaching Habib Bank, UAE and now Afghanistan. In addition to his international experience and illustrious domestic career, Khan is a highly qualified ECB Level 3 coach. Ireland coach Philip Simmons played alongside legendary West Indian players and has over ten years of coaching experience, including stints with Zimbabwe and now Ireland. Nepal coach Pubudu Dassanayake, a former Sri Lankan international has seven years of coaching experience, including Canada and now Nepal. Even the coaches of Hong Kong and the Netherlands have been on the job for a longer time than Jurgensen. BCB's know it all attitude and 'lack of time' are obstructions to the ideas brought forward by experienced coaches. This is a reason why many international coaches refuse to take the Bangladesh head coach role. They would not mind working at less compensation, for say a "cash-strapped" Sri Lankan Cricket Board, where their ideas will be heard, respected and receive better appreciation. There is not a single coach who hasn't had problems with the Bangladesh board. The BCB's passive attitude and procrastination is also hampering the development of the game. The BCB knows the team needs a batting coach. This has been spoken about in the media nearly a year ago - yet till date there is no progress. It was even being reported that former national team coach Gordon Greenidge would return to work with national team players and emerging ones in the academy. All talk and no implementation! Despite the poor state of the National Team's fast bowling, the BCB Academy does not have a single coach with a pace bowling background. The Under-19s have always been a breeding ground for talent. Yet, the last coach of international standard was Allister de Winter in 2006. For nearly 8 years, this team has been trained unprofessionally with local coaches quickly brought in and just as quickly discarded. These days world-class coaches are asked to train Under 19 teams. For example: the winning team of the 2014 Under-19 World Cup, South Africa, was coached by veteran coach Ray Jennings. Dav Whatmore coached the Indian Under-19 team which produced Virat Kohli. Former Bangladeshi head coach Stuart Law worked with Australia's Under 19 team. The Tigers are once again becoming the laughing stock of the cricketing world. All the good work done in the last couple of years have been undone by a couple of miserable months. The Associates are closing the gap. Pretty soon the commercial aspects and the fan-support will no longer be able to bail us out for our poor performance. It's time to get serious BCB! First and foremost, the BCB must appoint a professional head coach with actual experience in coaching a National or State team. There can be no room for any more experimentation. He must have the support of a batting, fielding, fitness, pace bowling and spin bowling coach. You can never hold someone accountable when you give him a 2-in-1 job. The Academy must have its own set of dedicated personnel, perhaps its own bowling coach, given the precarious state of the country's bowling. The Under-19 team must be given more importance. Playing Under-19 cricket is not a mere formality. It is not just about playing in age-level tournaments, it should be a system that brings together the country's finest age-group cricketers. It is Bangladesh's main production line for talent and thus must have the best possible supervisors. At the end of the day, one excuse that might arise is - the BCB does not have adequate resources for so many personnel or the BCB is unable to lure foreign coaches due to franchise cricket. This is where they must consider hiring locals - former players like Sri Lanka is currently doing. Why should Mohammad Salahuddin be coaching in Malaysia, when he can mentor the next generation of spinners? Or why should a legend like Aminul Islam be going around Asia promoting cricket when he can actually help our batsmen. It is because the BCB never shows any faith or confidence in them. In this world, there are some leaders who, when things go well, they look in the mirror and feel good about themselves. When things go wrong, these same leaders have a propensity to look out the window and find others to blame. Alternatively, there are leaders who when things go well they look out the window and look for people to thank and recognize, ensuring that the praise is spread around and that people get credit when it’s due. When things go wrong, these same leaders look into the mirror and analyze their actions to see if they could have done something different, taking responsibility and learning from the experience. It is time for the BCB to play the role of a leader and look into the mirror. Playing the blame game will not take our cricket anywhere. It is time to realize the mistakes which have led to this present situation and take corrective action. The World is watching! This page has been viewed 6226 times.